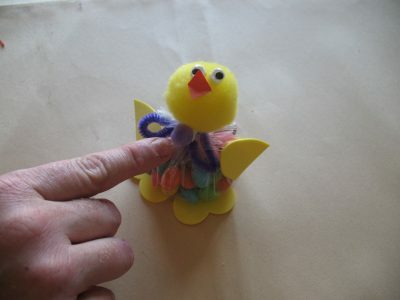 Jellybean Chicks: cute Easter kid's craft, make jellybean ducklings! Use colorful jellybeans, pom poms and craft foam to make these adorable Easter jellybean chicks. Assembly is quick and easy and fun for kids. 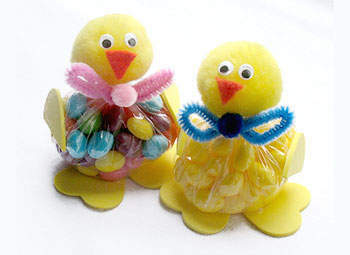 If you’re looking for an easy Easter craft that the kids can make and give to friends and family, these darling little jellybean chicks are a great option. They make fun little placeholders for the dinner table as well! 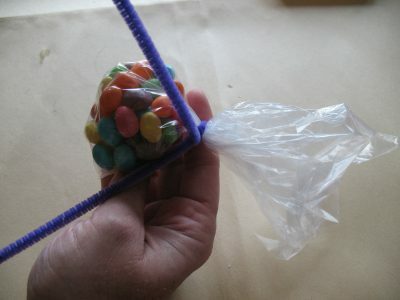 Place the jellybeans in the center of a square of plastic wrap. Gather the sides together and wrap with the pipe cleaner to secure. 2. Trim the excess plastic wrap about 1/2″ above the pipe cleaner. 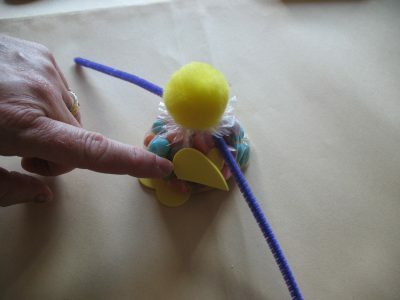 Glue the pom pom above the pipe cleaner to make a head. Glue two of the hearts to the opposite end to make the feet. 3. Cut the third heart in half to make the wings. Glue in place. 4. Cut the construction paper into a small diamond-shape for the beak. Glue it and the googly eyes to the face. 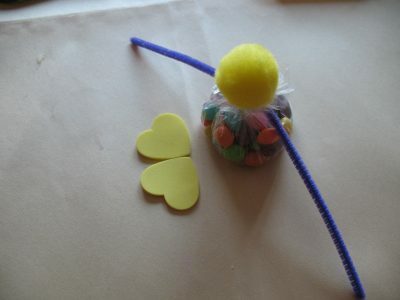 Shape the ends of the pipe cleaner into a bow and glue a small pom pom to the center of the bow. Be sure to check out all of our Easter crafts for kids. We also have a ton of ideas for crafts to make using jellybeans! This project was created by Amanda Formaro, originally for Kaboose/Spoonful. Shared on Fun Family Crafts on February 22, 2012.